Brace yourselves Kobas EPoS users – our latest EPoS update is now live and brings with it two features that we know you have been eagerly waiting for! Perfect for those wanting open food or drink buttons on the till, whereby the button is generic, but can be priced accordingly any time it’s used. Simply hit options on any item in your basket and adjust the price as required. The ability to make price adjustments is reserved for users with the EPoS > Price And Discount Availability Override permission. Say you run a pub that sells food, but you don’t run tabs. Up until now you haven’t had a great way to mark an order as being destined for a particular table, beyond adding notes to the individual items in your EPoS basket. This all changes today with the introduction of our new order properties, as now you’re able to add table information to your order. Select a table from our all-new table picker! 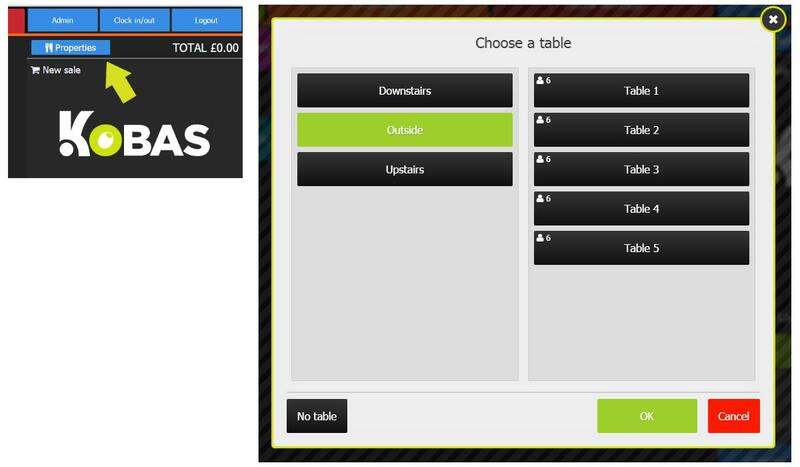 In order to use the table picker, you’ll need to contact support@kobas.co.uk to set up the table configuration for each of your venues. At present the new tables and notes functionality is only applicable to orders (not tabs) and prints the details on work dockets – much like the item options you’ll already be familiar with, but now for orders. As always, alongside these new features we’ve released a variety of usability enhancements and minor bug fixes, including updates for receipt printing, cash drawer support, iPad keyboards and a whole lot more. © 2009 - 2019 Kobas :: Your complete hospitality management solution. All rights reserved.